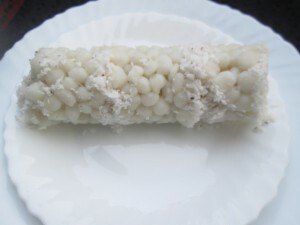 Puttu or steamed rice cake layered with coconut is a traditional breakfast item in Kerala. There are a variety of side dish combination for Puttu. Puttu & Banana, Puttu & Kadala (chick pea curry), Puttu & Kerala Fish Curry, Puttu & Chicken curry, Puttu and Cherupayar Thoran (Green Gram Stir Fry) & Pappad ( പപ്പടം ). Maniputtu are steamed rice balls served with curry, ghee or sugar. This is very easy to make within minutes and can be used as a nalumani palaharam. To steam Puttu in a cylindrical shape you need a Puttu maker or Puttu Kutti. Try this simple food item & enjoy your breakfast! Heat a bowl then boil water with enough salt in it. When the water boils, add the rice powder and mix well. Turn off the stove and cover it with a lid. After 5 minutes when the dough is still warm & knead it very well. Note: Apply a little oil on your palm and make small balls of the dough. Sprinkle some rice flour on the balls to prevent them from sticking together. Take the puttu kudam with 2 cups of water and allow it to boil in a medium flame. How to fill the puttukutti: Take the puttukutti with the rounded shaped 'achu' inside the puttukkutti. Then layer the puttukutti first with 1 tbsp of grated coconut & add 5 tbsp of rice balls. Again fill it with grated coconut followed by rice balls. Repeat the same process until the puttu kutti is filled. Put the lid over the puttukutti. Keep the steamer (Puttu Kutti) on the pot (Puttu Kudam) and allow it to steam for 8 minutes. After 8 minutes, switch off the flame and remove the puttukutti from the pot. Then gently push the maniputtu using a wooden laddle. Tasty Mani Puttu is ready. Serve hot with ghee, sugar or curries.